Not a million reasons – but rather 5 million reasons – to spay & neuter your pets. That’s right, 5 million dogs/cats are killed annually in animal shelters due to over pet population and homelessness. This mass euthanasia of defenseless animals in our communities is staggering! Get the Facts. 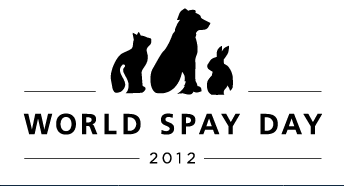 World Spay Day (Feb 28) is an annual campaign of Humane Society International and The Humane Society of the United States (HSUS) to inspire people to save animal lives by spaying or neutering pets, street dogs and feral cats -- not just for one day, or one month, but all-year long. Be informed and be an advocate for spay/neuter and responsible pet ownership in your community. Do you know the Top 3 Reasons to Spay & Neuter? Looking for a fun way to celebrate Spay Day? Join us at a Special World Spay Day Event in Los Angeles with some of the nation’s biggest cat lovers and advocates -- FixNation and special guest, Jackson Galaxy. Enjoy complimentary drinks, vegan hors d'ouevres and the street photography of Ansel Adams at the Edgar Varela Fine Arts and DRKRM Galleries in Downtown LA. Buy your tickets today! Check out this fun new FixNation PSA by Jackson Galaxy and promote spay/neuter by sharing with friends on Facebook and Twitter! They created an awesome targeted awareness campaign called I HATE BALLS (ihateballs.com) – it’s cheeky, edgy, most importantly, helps spread the important spay/neuter gospel while raising funds to support the over pet population crisis. They provide a detailed resource for all things spay/neuter including a comprehensive guide of low cost/free services. Dedicated to reducing the population of homeless cats by sterilizing as many as possible while demonstrating the effectiveness of Trap-Neuter-Return and colony management for the humane care of homeless cats. Make a difference in your community by being a responsible pet owner and spreading the spay/neuter message.